The center of Nagoya is dominated by the JR Central Towers, a 245-meters tall twin skyscraper, housing the headquarters of the Central Japan Railway Company and the JR Nagoya Station. Since the skyscraper is actually the station’s building, the Nagoya Station is the tallest railway station building in the world. 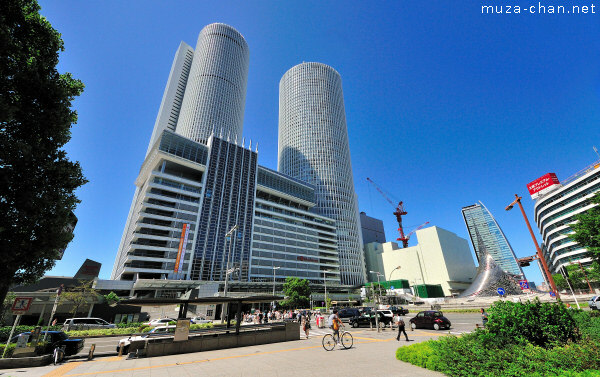 The asymmetrical towers are rising from a 20-story base which houses the Station and the Takashimaya department store. The taller and thicker tower is called the Office Tower, 245-meters tall (51 floors), while the smaller one, 226-meters tall (but with 53 floors) is the Hotel Tower - named so because it houses the Marriott hotel. The building holds another record too, being the world’s largest train station complex - calculated by floor area - 410,000 square meters.